Each year, thousands of yogis from around the world travel to Times Square to celebrate the Summer Solstice, the northern hemisphere’s longest day of the year, which become part of this global celebration. The 2018 Solstice in Times Square: Mind Over Madness Yoga, presented by Aerie, was the second year that Tiger Party helped Aerie to launch #AerieREAL O2O campaign. As all marketers might know, the best way to call to action User Generated Content, is letting the potential user find your campaign interesting and getting involved with it. Through Tiger Party's Social Moderation Platform, users located content with the event hashtag of #AerieREAL from public information on social networks like Facebook, Twitter, and Instagram. 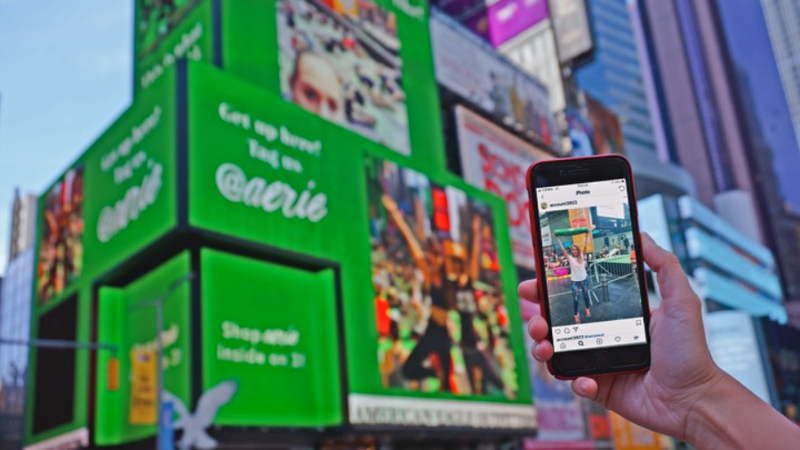 After the evaluation by the brand manager, User Generated Content, was projected instantly to Times Square digital billboards, while the system broadcasted the footage back to participants. Thus generating exclusive interaction breaking regional bounds, enabling global consumers to exhibit their personal memory in Times Square on the social networks. 2018 PyeongChang Winter Olympics Campaign and #AerieREAL summer solstice International Yoga Day Campaign which just concluded, both utilized this strategy in generating interactions with its global consumers. In #AerieREAL yoga event, Social Moderation Platform of Tiger Party received 3508 feeds tagged with #AerieREAL in four hours. Over hundreds of users had participated in the broadcast, creating an irreplaceable brand memory.